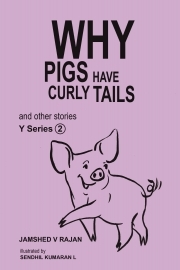 Description of "Why Pigs Have Curly Tails and Other Stories"
Jamshed V Rajan and Sendhil Kumaran L have teamed up to create this collection of ten short stories with morals for students and kids yet to join school. These stories are based in the fantasy World of animals, plants and insects. In these rides of imagination, these short moral stories give wild and wacky reasons for why things are the way they are. Each short story ends with a moral, which your child can learn. As a parent or grandparent after reading the book to the child, you can decide to elaborate on the moral for a better impact. Why do pigs have curly tails? Why do bears love honey so much? Why are polar bears white? Why do bulls and cows have horns? Why is Broccoli shaped like a tree? Why do hippos love water so much? Why do cheetahs have spots? Why do spiders have eight legs? Why is a parrot green? Why is a dragonfly named after a dragon? Each of these stories come with amazing illustrations. With the illustrations, the illustrator has attempted to transport the reader to the very spot where the story takes place. Let your child’s imagination run loose. Have them read this book now! This children’s book second in the "The Y Series" and more are coming soon. Reviews of "Why Pigs Have Curly Tails and Other Stories"